The conversion of forests into agricultural lands is a major cause of deforestation, particularly in the mountain ecosystems of northern Thailand. It results in a rapid loss of biological diversity of both flora and fauna. In addition, the above-ground biomass (AGB), which can be a major source of carbon storage, is also decreased. This study aimed to predict the AGB in Doi Suthep-Pui National Park, Chiang Mai province, based on land-use/land cover (LULC) changes from 2000 to 2030. Landsat-5 TM (2000) and Landsat-8 TM (2015) satellite images were analyzed to predict LULC changes to 2030. Temporary plots (30 m × 30 m) were established in each LULC type for AGB analysis; trees with diameters at breast height ≥ 4.5 cm were identified and measured. AGB of all LULC types were analyzed based on specific allometric equations of each type. 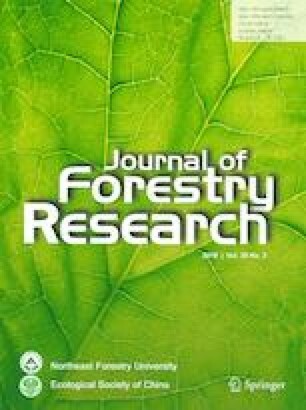 The results show that area of forest and non-forested areas fluctuated during the study period. Through the first 15 years (2000–2015), 5% (2.9 km2) of forest changed to either agriculture or urban lands, especially mixed deciduous forest and lower montane forest. There was a similar trend in the 2030 prediction, showing the effect of forest fragmentation and the resultant high number of patches. Total AGB tended to decrease over the 30-year period from 12.5 to 10.6 t ha−1 in the first and second periods, respectively. Deforestation was the main factor influencing the loss of AGB (30.6 t ha−1) related to LULC changes. Furthermore, habitat loss would be expected to result in decreased biological diversity. Consequently, a management plan should be developed to avoid unsustainable land use changes, which may adversely affect human well-being. Project funding: The work was supported by the Center for Advanced Studies in Tropical Natural Resources (CASTNaR), Kasetsart University, Bangkok, Thailand, and the Kasetsart University Research and Development Institute (KURDI). We would like to thank the head of the Doi Suthep-Pui National Park, Chiang Mai Province and his assistant as well as the students from the Thai Forest Ecological Research Network (T-FERN) who contributed to the field observations.